Dan Swaim | Suzuki Bass Lessons, Teacher Training, Masterclasses, and Seminars including "Every Child Can." Suzuki Bass Lessons, Teacher Training, Masterclasses, and Seminars including "Every Child Can." 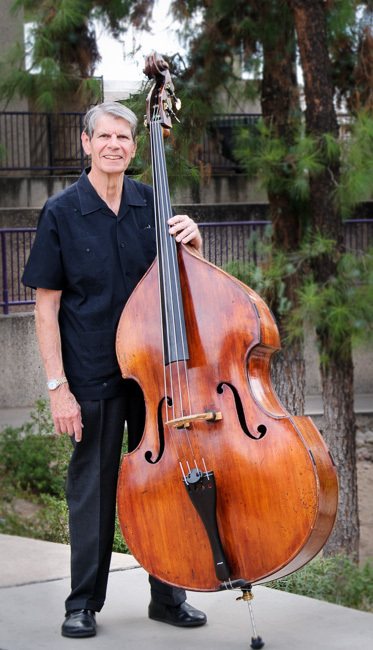 Dr. Daniel Swaim, Professor Emeritus of Double Bass, Arizona State University, taught at the collegiate level for thirty-nine years. Before moving to Arizona, he taught double bass, music theory, and jazz studies at Wichita State University. Besides his university teaching experience, Dr. Swaim taught strings in the public schools of Atlanta, Georgia and Richardson, Texas. He played in the Atlanta, Dallas, Fort Worth, Phoenix, and Wichita Symphony Orchestras, and he performed at the Kansas City and Wichita Jazz Festivals. He also performed with the Arizona Opera and the Brevard Music Center Orchestra. Dr. Swaim’s principal teachers were Joseph Van Reck and Murray Grodner and he earned degrees from Cincinnati-College-Conservatory of Music, Indiana University, and the University of North Texas. Dr. Swaim was the first double bassist to win the coveted Performer’s Certificate at Indiana University School of Music. In 1988, Dr. Swaim joined the Suzuki Association of the Americas (SAA) and began developing the repertoire for the Suzuki Bass School. In 1993, he became the first Suzuki Association of the Americas Bass Teacher Trainer, and thereafter, he was appointed Chair of the SAA ad hoc Bass Committee. During the past two decades, Dr. Swaim and the Bass Committee have revised the original Books I, II, and III of the Suzuki Bass School and have published Books IV and V as well. The committee anticipates a completed series of nine or ten books with a major concerto being the final book of the series. During the past three decades, he has been a presenter at major conferences in Albuquerque, Brazil, Chicago, Matsumoto, Kansas City, Las Cruces, New Orleans, Minneapolis, Phoenix, Rochester, San Francisco, and Savannah. Music is a language of the heart without words. The ability to feel music means understanding the human heart. One ability is created first, then a new ability is built on it, and then another new one is put on top of the other, and so on one after another. Although now retired from university teaching, Dr. Swaim maintains a studio of young bassists who range in age from four to eighteen years. All students are taught in the tradition of the late Dr. Shinichi Suzuki’s philosophy and his pedagogical principles. In 2009, the Arizona Chapter of the American String Teachers recognized him as the Outstanding Studio Teacher of the Year. His students continue to win recognition at state and national levels. Suzuki Bass teacher training and the pre-training study, Every Child Can! Private and group bass lessons. Public school music coaching and consulting.